From the 25th January 2019, the rate at which Additional Dwelling Supplement (ADS) is charged in Scotland will increase from 3% to 4% for those buying a second home, rental property, or residential property that is in addition to their primary residence. Where the ADS applies, there is a further 4% charge on the full chargeable consideration added to the Land and Buildings Transaction Tax (LBTT) liability for certain transactions with a relevant consideration of £40,000 or more, where the subject-matter of that transaction consists of or includes the acquisition of ownership of a dwelling in Scotland. The ADS payable for a residential property transaction within the scope of the additional amount of LBTT will therefore be charged on the whole relevant consideration for that transaction. Our investor clients can calculate ADS along with LBTT using this Tax Calculator. 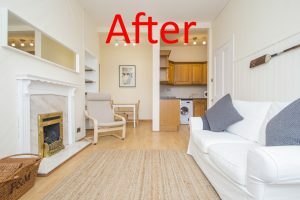 The Edinburgh rental market is currently tilted in favour of landlords but if a landlord presents and dresses a property to look at its best then rents will be maximised, voids minimised and a better quality of tenant will be found who in turn is likely to stay for longer. More than 80% of tenants start their search online so it is crucial that high quality pictures and floor plans are used to ensure that the property stands out. For a little investment landlords can increase rentals and at the same time add the cost of the upgrade to the value of their investment. An example of how to present your rental investment and the asset management we have just carried out for a client is shown below. Purchase price of £130,000 with Home Report value £130,000. Let within 24 hours of being advertised at £750 pcm. If you want to maximise your buy to let investment then call 0131 473 1591 or use our online contact form. The Private Housing (Tenancies) (Scotland) Act 2016, which takes effect from 1 December 2017, will introduce the ‘private residential tenancy’. Its purpose is to improve security for tenants and provide safeguards for landlords, lenders and investors. We have studied the changes and below covers the landlord view. In our opinion the introduction of Private Residential Tenancies is simply a legislative change which landlords should not be overly concerned with. The Scottish Government website provides further information. 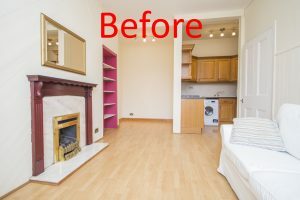 To find out more about letting your property in Edinburgh, call our letting team on 0131 473 1591, or use our online contact form. One of the first questions landlords ask is whether to rent out their property furnished or unfurnished? There are of course pros and cons to both and differing target markets require different approaches. Less initial set up cost to landlord and less responsibility. 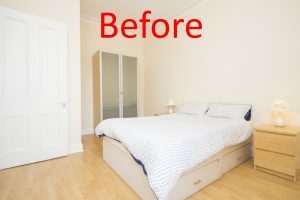 Tenants may stay longer as they have made an investment in furniture and moving will be more costly. If there is tenant demand then rental income may be equal to furnished. Generally, there are more tenants looking for furnished property which means a higher rent and more applicants to choose from. You, the landlord, only need buy the furniture once and will have made sure it is the right style and size for the property. A nicely furnished property looks move inviting and homely than one devoid of furniture.